Charismatic Roman Catholic priest, Rev. Fr. 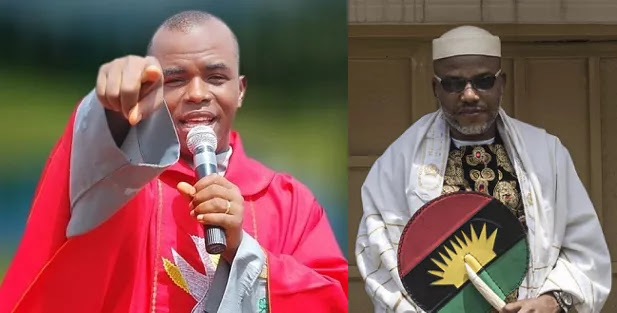 Ejike Mbaka of the Adoration Ministry, Enugu, has finally spoken about the leader of the Indigenous People of Biafra (IPOB) Nnamdi Kanu and the agitation for secession. In a three-minute video posted online, Mbaka insisted that Igbos were not hated. The infulential cleric also stated that Kanu and the other Biafra fighters, should not be the ones in the forefront of the battle. Mbaka said: “Nobody should deceive you saying that ‘Igbos are hated’. That’s how we (Igbos) believe nonsense. The poor masses are told to agitate for Biafra. “There is nothing wrong in Biafra. But those that say they want Biafra now (or never) should come out let us see the crème of the Igbos then we all will push for Biafra. “Let the crème de la crème among the Igbos be at the forefront while the poor masses that loiter the streets in the name of Biafra will support from behind. “The right thing is for parents to protect their children from danger. I am not against Biafra but let the Igbo political elites; the Ubas of Anambra, Peter Obi, Ekwueme, Ekweremadu, Nnamanis, Sullivan Chime, Anyim Pius Anyim, I (Mbaka) etc should be the ones pushing for Biafra not our children who get killed on the streets every day.